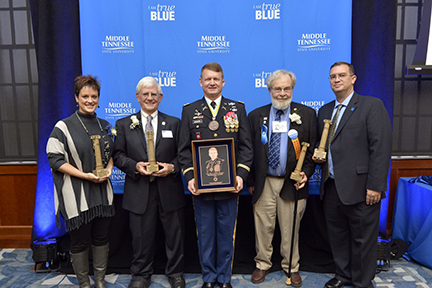 Two alumni from the College of Media and Entertainment were honored at this year’s Distinguished Alumni and True Blue Citation Awards ceremony, held Oct. 2 as part of MTSU’s Homecoming festivities. Britnee Kinard, Class of 2005, Recording Industry, received the True Blue Citation for Community Service award, while Eric Paslay, Class of 2005, Recording Industry, was the recipient of the Young Alumni Achievement Award. Kinard founded the SD Gunner Fund, which provides assistance to soldiers and their families in Evans County, Georgia. The organization was inspired by her own 15-month struggle to obtain a service dog for her husband, retired Sgt. Hamilton Kinard, who was injured during his service to his country. His dog is the first mobility service dog approved in the Southeast coastal region. The SD Gunner Fund, named for the sergeant’s service dog, assists veterans and disabled children with the financial expenses associated with owning service animals, and the organization expects to help 3,000 military families in the coming year. Britnee Kinard also was the recipient of the first Caregiver Award at the Friars Foundation’s inaugural Lincoln Awards in May 2015 in Washington, D.C.
A Platinum-selling hit songwriter, Eric Paslay has celebrated five No. 1 hits including “Even If It Breaks Your Heart” (Eli Young Band), “Barefoot Blue Jean Night” (Jake Owen), “Angel Eyes” (Love & Theft), “Rewind” (Rascal Flatts) and “Friday Night,” the smash lead single from his critically acclaimed self-titled debut album. Paslay has earned nominations for GRAMMY Best Country Song, ACM Song of the Year and CMA Song Of The Year for “Even If It Breaks Your Heart.” A true artist’s artist, USA Today calls Paslay “flat out-brilliant,” and American Songwriter names him an influencer of country music. He has penned tunes for Amy Grant, Donny and Marie Osmond and Lady Antebellum, and Dionne Warwick and Kenny Rogers have sought him out to record duets. Paslay recently received the “10 Songs I Wish I’d Written” Award for his artful, breakthrough ballad “She Don’t Love You” at the 2015 Nashville Songwriters Association International Awards in Nashville.